It is HOT outside but I refuse to complain because I haven’t forgotten how FREEZING cold I was all winter long. Today the temperature is inching over 90 which is considered quite warm for the mountains of Western North Carolina. My very long hair is pulled up in a ponytail and I am dressed in a swirly skirt and a pair of pretty sandals. Fortunately, I don’t wear foundation or it would be melting down my freckled face. As far as make-up is concerned…less is best in this steamy weather. Visualization comes in handy in weather like this. I’m thinking ocean…miles and miles of an endless horizon. I pull up a memory from my younger years when the ocean was within hollering range as they say in the mountains. 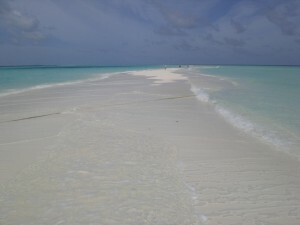 I am walking on a sandbar and loving the feel of the wet sand between my toes. It feels deliciously wonderful! I give him my best, this is nothing…just wait until the middle of the winter when I’m freezing my tuchas off look and continue walking. I laugh my way down the street determined to make the best of this heat!